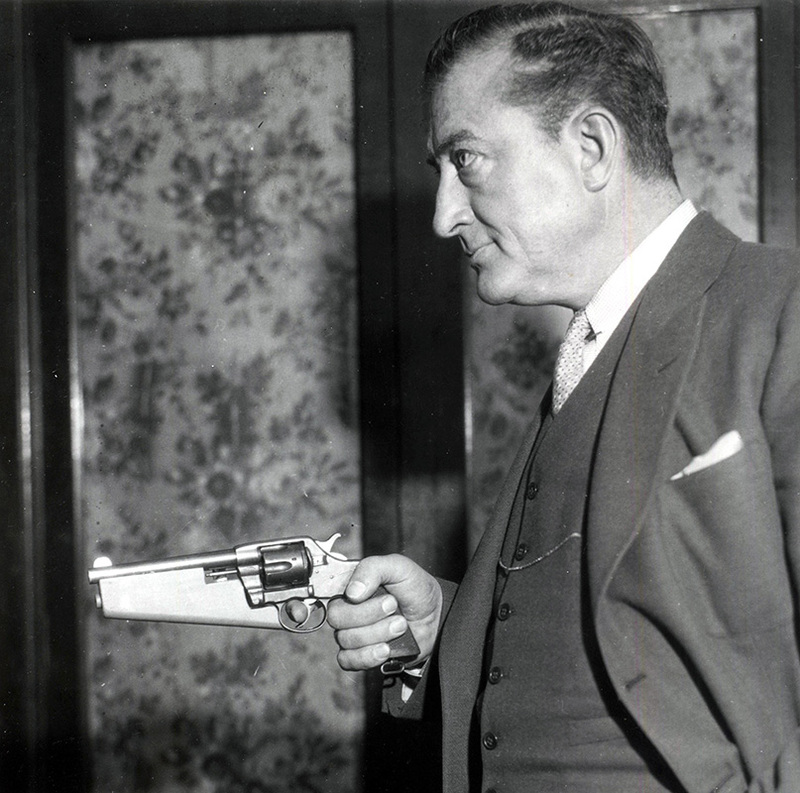 Sometime in 1933 the famous screen actor/director Francis X. Bushman seen here came up with the idea of melding an actual gun with a camera that could shoot bullets as well as still and motion pictures as an aid to law enforcement. The idea was even if the bad guy escaped the bullets, he couldn’t avoid getting his mug shot taken and thus sealing his eventual captured. Something smaller and less noisy was needed by real world spies which prompted inventors around the globe to search for the perfect spy camera. As a result untold variations were created, a few literally shaping the history of nations and wars, cold and hot. As an offshoot, “spy camera” compact design eventually entered the consumer market, some basically toys, others hi-tech wonders. Here are a few from the author’s collection of vintage cameras, but only touching upon the tip of the spy iceberg. The HIT – Was It? If you were a kid growing up in the 1950s and read comic books, you saw an endless flow of ads, small ones, for The Hit…and you just had to have one because it was so “spyish” and cool. Your parents probably tried to explain that it was a toy and you couldn’t photograph a barn door with the Honey-I-Shrunk-a Real-35mm Camera. But no doubt you pressed on as I did until you had one. Okay, so it took 40 years before I added a Hit to my current collection and now you many find many for sale on the Internet, some with their original cases and even film. In any case, The Hit seems to remain on the hit list of spy cameras even if no self-respecting agent would use one. The Hit was the product of the Tougodo Optical company founded in Japan in 1930 and named as things often were at the time after a military personage, in this case Admiral Tougo of the Japanese Navy. The camera relied on 14x14mm film. Actually there are several variations of sub-mini 1950s cameras from Japan, the prices ranging from $10- $3,000 depending on their level of rarity. This one cost me $3 at a garage sale. The MEC 16 was produced by Germany’s Feinwerke Technik around 1957-60. This example, an SB was updated in 1960, and gained milestone status as the first TTL Camera (Through the Lens Metering system) by incorporating a Gossen Selenium Exposure Meter in its subminiature design, no mean feat as the camera in closed position measures only 4 x 2.5 x 1.5 inches. It utilizes a high quality Rodenstock f 2 22mm lens, making it one of the fastest subminis ever made. Its “Cats Eye” pupil diaphragm is adjustable f 2.0 to f16 with focal plane shutter speeds from 1/30 sec. to 1/1,000 sec. with a range of focus form 1ft. to infinity. Considered a top of the line “mini,” they are considered rare, prices reaching $250 and beyond. Produced apparently for only one year, 1949, it was designed to mimic the shape of a movie-camera. While certainly spyish in appearance and size and all metal in construction, the optical performance of the f6.3-11.0 Anastigmatic fixed-focus lens with a fixed shutter speed of 1/50 second, was mediocre at best. It did sport a pop-up viewfinder, flash synch and provided 14 exposures per magazine. A later version included an f8 lens and a slightly fast single speed of 1/60 second. Boxed sets include the camera, flash and spare bulbs, negative holders, tripod and film and still have good cool factor. Popular with the KBG and other international espionage organizations up until the 1990s when digital took over, the incredible Minox was actually designed and first built in Riga, Latvia, then later in Germany. This example, a Minox-B literally fits in the palm of your hand at least without its various attachments as shown here including flash and binocular mount. Production started in 1958 and ran to 1969 when it was replaced by the improved Minox C, but it never surpassed the popularity of the Minox-B. The Minox B features a Complan 15 mm f/3.58 4-element lens with shutter speeds of 1/2 – 1/1000 seconds with a focal range from infinity down to eight inches. A special braided metal chain allows for precise distance measurements for documents being photographed. The Minox B is capable of producing up to 50 photos using a single cartridge and still a highly usable camera, film and processing available, though not cheap. There are miniature cameras, sub-miniatures and micro-miniatures…all based of course on size and weigh though not necessarily quality of images produced, such is the case of this camera that wore several brand names. Founded in New York City in January 1933, The Universal Camera Corporation was the brainchild of loan company exec Otto Wolff Githens and his partner, taxicab insurance agent Jacob J. Shapiro, both believing Americans needed a very affordable camera. With that idea in mind, they approached the Norton Laboratories requesting they design a small Bakelite camera, simple to use, and cheap to manufacture. Naturally, seeing a good thing, Norton started selling the camera under their own name. Not giving up, the original Universal company went on to manufacture the Univex Model A themselves as well as several other cameras. Although most people have no recollection of the camera today, Universal eventually sold more cameras per year than any other company in the world, at least for a time. Keeping to their prime directive of affordability, the Univex Model A sold for 39 cents with over 3 million purchases in the first three years. Boosting the sales was the inexpensive six-exposure rollfilm that was packaged in Belgium and sold for only 10 cents in the United States. 22,000,000 rolls where sold in 1938. However, it was the monopoly on the special Univex film that contributed to the collapse of the company in 1958. Described as the size of a deck of cards, it was actually much smaller and could be concealed inside a pack of cigarettes, apparently a popular combination with detectives of its day. Using 16mm film via a 24 exposure cartridge, it appeared on the “spy camera” scene in 1946, just after WWII’s end, the design of a Hollywood, CA concern named after its founder, It relied on an achromatic doublet f6.3 lens with fixed focus and a single speed although the aperture could be adjusted for lighting conditions and color film usage via 1:11 (bright), 1:8 (dull), and 1:6.3 (color). Production ended in 1950, a short run for the popular mini that sold for a relatively expensive $30 in the 1940s, about what people were earning on a weekly basis at the time. Today prices range from $25 to several hundred for very rare editions. In closing, if you’ve got the bug for vintage cameras, small or larger, remember condition, condition, condition….and keep both eyes open on the Web, at garage sales and swap meets. You may just find that treasure. But remember, the value is in the history, the quest and the kinds of cameras that open wide your own apertures of interest. Do your research by surfing the Internet or purchase a couple quality camera collector books as resources. Happy hunting! 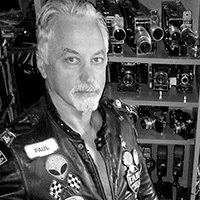 Paul Garson is a writer and photographer. He has contributed to many magazines and periodicals, and has published both fiction and nonfiction books as well as written two screenplays that have been produced. He served as a university instructor of composition and writing, as well as a martial arts instructor. His public relations and marketing projects included several for national and multinational companies. His previous books include Album of the Dead, concerning WWII in Europe, available through Chicago Review Press, and New Images from Nazi Germany available through McFarland & Publishers.